Strong Hand BuildPro TMB57846 Welding Table 78 In. X 46 In. 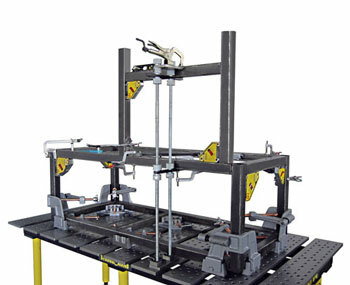 Home > Stronghand Clamps and Tables > Build Pro Welding Tables > Strong Hand BuildPro TMB57846 Welding Table 78 In. X 46 In. 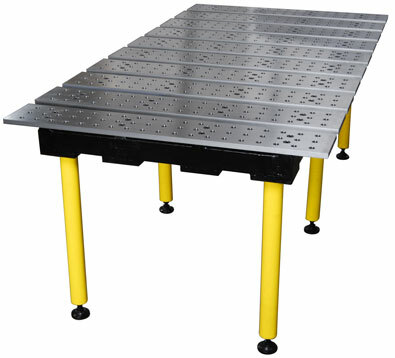 The Build Pro welding table by StrongHand Tools is one of the most adaptable welding and fixturing tables on the market today. The modular design allows the precision ground and CNC machined top plates to be reconfigured to extend the width of the table for larger projects. The table is also easy to set-up and tear down, saving valuable work space. The BuildPro will help you decrease fixture set-up time, and increase work efficiency. Hole diameter: .625" + .002"
Hole spacing: 2.000" ? .0015"
Free shipping for commercial address customers with a forklift to unload the equipment. Select the lift-gate option and/or residential option if appropriate. Customer will be responsible for additional freight charges if they are incurred. Strong Hand BuildPro TMB54738 Welding Table 47 In. X 38 In. Strong Hand BuildPro TMQC57846 Welding Table 78 In. X 46 In. 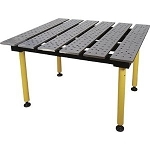 Strong Hand BuildPro TMB59446 Welding Table 94 In. x 46 In. Strong Hand BuildPro TMA54738 Welding Table 47 In. X 38 In. Strong Hand BuildPro TMQB57838 Welding Table 78 In. X 38 In.